or How Fast Does Google Think We Drive? I picked this question up on Twitter a while back and really liked it. So, after we worked on making a plan, I thought it would be good to look at data. Lots of data. And then coming up with ways to make sense out of it. So, we took to Google. Students went to Maps, entered starting location and destination (I didn't realize that I'd need to explain that you can't drive from California to China, but, whatever.) and then entered their data into a Google Form. We did this over five different classes and got a lot of "stuff" to sift through. We dumped the data into GeoGebra and then took a look at a few different perspectives. It's interesting to see how the data changes as we look at trips of different distances. The applet below will really give you a good picture. When points don't line up perfectly, sometimes we can use a line to help us answer questions. As soon as we have a line we like, the actual data points can kind of get in the way. You can't drive to China. These are 7th graders and they have some experience with linear relationships. However, that experience has been limited to "the number in front of the x is the slope and the other number is the y-intercept" kind of stuff. It really threw some kids that their line of "best fit" may not have been the same as everyone else's. We are doing this very informally at this time. I know that the formal process for determining a linear regression is pretty involved, but does it have to be for a proportional relationship? That is, if we know a relationship (like distance : time) is a proportion but the data doesn't line up exactly, is it appropriate to simply average the distance:time ratios to determine a "rate of best fit?" 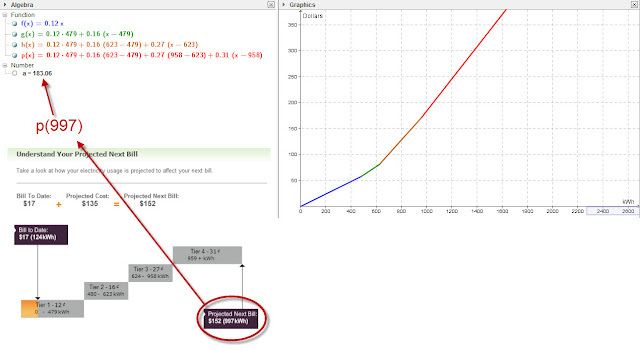 When informally drawing a line of best fit for a proportional relationship, should (0,0) always be the starting point? Questions? Yeah, I've got questions. My electric bill is a mystery. I started looking into how the bill is actually calculated and found some interesting stuff. @dcox21 oh you Californians and your complicated pricing schemes. @dandersod I prefer to call it "social engineering." @dcox21 Hi David, please feel free to contact us at CCOeChannel@sce.com or call us at 800-655-4555 if you have questions. I don' think SCE appreciated the "social engineering" comment. So, I decided to turn this into a 3 Act lesson. Except, their price doesn't fit my model that I modeled after their model. I blogged about the template I'm using. Most of the activities we have done have focused on a particular piece. We did two quick activities focusing on making a plan. Before sending students outside, they had to submit their plan for peer review. If another group could read their plan and understand what was going to be done, then I signed off on it. Question: How far is it from the first tree to the last tree (ie. 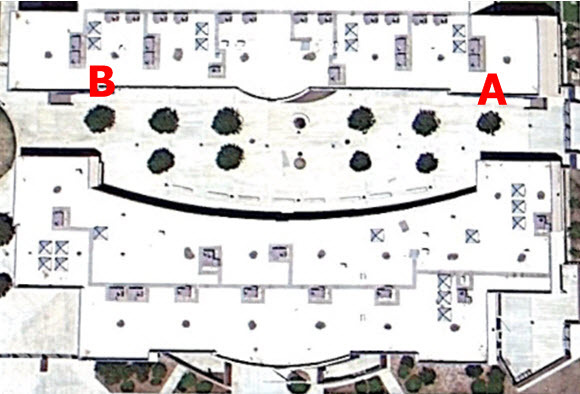 point A to point B)? Rules: You can take a pencil, paper and clipboard outside with you. Nothing else. Student: "Mr. Cox, we are going to measure from the first to the second then multiply by the number of spaces." "Yeah. Because the spaces are the same." "How can you be sure? " "Yeah, I want them to be the same too. That'd be really helpful, huh?" Oh, you want my help? Lemme show you how Google Earth can help you out here. 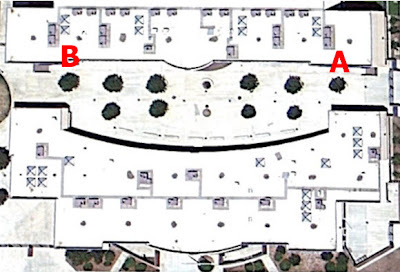 Question: Come up with two different methods for finding the height of the building. Rules: Don't climb up there. 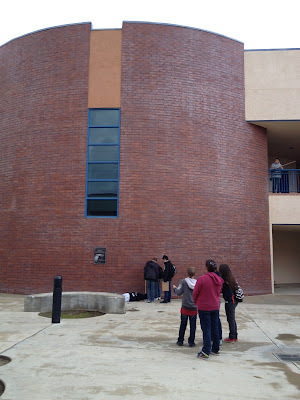 Take a picture of Cameron next to the building and see how many Camerons to the top. All kinds of crazy uses of a meter stick. "Ask Chuck" allowed us to discuss the importance of trustworthy sources of information. And Chuck is awesome. He'd throw out all kinds of crazy numbers and see if kids would bite. I decided to go with a process rather than specific content in this class. I know stuff is going to be on the test and we need to cover it. But, I also know that my students will one day leave and go be anything but a scientist or a mathematician. So I settled on asking students to question, think, plan, model/analyze and tell people about what they did. That's it. Everything we did this semester followed this template. I found the following questions/directives to be helpful when turning students loose on a problem. I think we call this "inquiry", but I really don't know anymore. Does it count if I give the question? 2. What do you think the answer's going to be? Props to Dan for making a guess be an explicit part of the lesson plan. Something I should've been doing 10 years ago but somehow didn't. 3. What smaller questions will you need to answer first? This is tough. Students live in circular argumentation. I mean, c'mon kid, give me at least a spiral argument once in a while. The name of this blog should mean I have some grasp on the importance of questions, but I've never explicitly asked students to break larger questions into smaller manageable questions nor realized how badly students need help with this. 4. What's the plan for answering the smaller questions? 6. Make sense out of the data. This was the sweet spot. How can math be used to turn data into an answer? Kids are getting the hang of this and it's fun to watch. Cross check the answer with the guess. 8. Tell someone about it. I use the word "presentation" very loosely here. This was anything from a write-up to a group presentation to an informal interview after an activity. None of this is new. But, for some reason, it seemed new. The first few activities we did would focus on a particular piece (I'll blog about these--this year. Promise.). The challenging part was to keep from over-planning. Not because I'm that kind of teacher, but because the more I planned, the less students had to. And, well, #4. Oh, and time. It takes a lot more time to have students make the plan and we have bells.